If you have been with me for some time you will know that I love to make soap. I have stated that I wish I had a way for you to be able to smell the fragrances and use the soap. I have way too many bars here that are beginning to take over my laundry room. Which means some bars need to have a new home. What does that mean to you my lovely blog reader? You can have a few bars for your very own!! Uh-huh, you read that right. So what is the catch?! You need to post a comment on my blog. The posting date starts today (June 27th) and will end midnight on July 11th. I will write your name down and you will be placed into my soap pot. How will I select a winner? One of the boys will pull the winning name out of the pot on July 12th. I will announce the winner with a picture. Oh, right, shipping.. don’t worry about it. I will cover the cost of shipping to you! 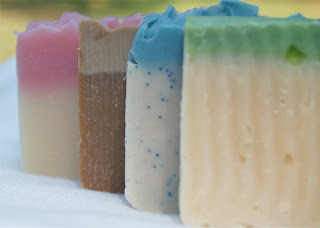 All the soaps contain wonderful shea butter and cocoa butter. The soaps will arrive to you wrapped and will contain an ingredient list. Wow! I'd love some soap. Soap is good. :-) Oooo. Pick me! Pick me! Heck yeah! I want to win some yummy soap! Thanks a bunch!! Mmm...sounds lovely!! I'd love to win this, if I may be entered :) Thank you for the chance!! Pick me!!! I want some soap too!!! !